-No charging or control just audio. Universal 3.5mm Audi AUX input for any device with an audio output. "Add USB for Charging" Adds a cable with a female USB to charge your phone. "Add USB for iPhone charging and song +/- control from radio and steering wheel controls" Adds a USB port for charging and can also control song +/- from your radio and steering wheel controls. Other items compatible with your car. -Only cars with the RNS-E navigation radio have this connection. See Products that connect behind the radio if you do not have the navigation radio. -Replaces glove box mounted CD Changer. Audi A3 2008-2013 -All cars have this connection in the glove box. If you do not have an iPod dock or a CD changer the top left shelf is a removable pocket. 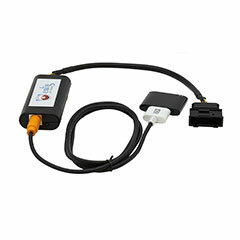 Audi A4 2002-2007 -Only cars with the RNS-E navigation radio have this connection. See Products that connect behind the radio if you do not have the navigation radio. -If you have an iPod dock or CD changer in the glove box then you have this connection. -If you do not have an iPod dock or a CD changer the top left shelf is a removable pocket. -Early TT's all had this connection in the glove box. Somwhere around 2010 Audi removed this connection on those cars you must use one of our devices that connects behind the radio.